Performance Time: Approximately 90 minutes, 66 pgs. DRAMA. Winner of the National Endowment for the Arts Award. Adapted from the short story by Stephen Crane. 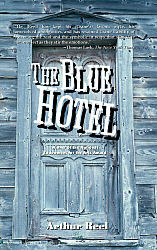 Three strangers arrive at the railroad town of Romper, Nebraska, and seek out a room at a local hotel. Upon their arrival at the hotel, one of the strangers, a Swedish tailor from New York, begins to act strangely. He becomes extremely frightened, so much so, that he fears for his life. The hotel proprietor, Pat Scully, tries to calm him down, but the Swede’s paranoia only increases, making the others feel more and more uneasy. As the play progresses, the Swede becomes increasingly alienated and estranged from the group, and his outlandish behavior only creates further hostility that threatens to erupt into violence at any moment. Arthur Reel founded the Drama Repertory Theatre in 1973 and has co-produced more than 200 shows, many of which he directed. Mr. Reel has adapted for the stage many prose classics, including Voltaire’s Candide and works by Gogol, Gorky, and Chekhov. He currently resides in New York City, where he teaches acting, voice, and communications.